There’s an emerging perception that Apple isn’t going to focus on their server platforms, and it’s causing organizations to think about migrating from Apple Open Directory. While the validity of the perception about Apple’s stance on its server software is unclear, the need to manage users on Apple Mac platforms remains certain. Apple’s Open Directory solution was created to be an on-prem directory service much like Microsoft’s Active Directory. Open Directory forked the LDAP software and has also integrated a number of other components, including Kerberos. The solution has often worked well for organizations that are exclusively, or at least predominantly, Mac based. As the IT network shifts to the cloud and a heterogeneous platform environment, the question becomes, how should an organization’s identity management infrastructure evolve? One thing is certain: today’s modern IT infrastructure is more complex than ever. IT admins are smartly leveraging every type of resource they can to build IT solutions that help their users to increase productivity and security. Oftentimes, that starts with a BYOD (Bring Your Own Device) culture, and that usually means Macs and Linux machines. Very few organizations are building new data centers or investing in their existing ones. Infrastructure-as-a-Service providers, such as AWS and Google Compute Engine, are making the days of self-managed hardware and network gear a thing of the past. A web-based application probably exists for just about every function within a company. Those SaaS-based applications are the new norm for workers and IT. Some of those solutions, such as Google Apps and Microsoft Office 365, are at the heart of organizations. And, of course, organizations are moving to WiFi networks and mobile devices. So, how can an IT organization tie all of these various IT resources together? Legacy solutions, such as Active Directory, OpenLDAP, and Open Directory, were not created with this type of complex infrastructure in mind. As a result, IT organizations are shifting their attention to cloud directory services platforms such as Directory-as-a-Service®. The concept is to provide a SaaS-based directory service that connects users to all of their IT resources. Those IT resources include their Mac, Windows, and Linux devices as well as their web and on-prem applications. What are the main differences between the legacy directories and these modern solutions? Well, modern solutions tend to be multi-protocol, location agnostic, highly secure, and cross-platform. Of course, their hosted nature also relieves the burden of implementing and managing a directory service. 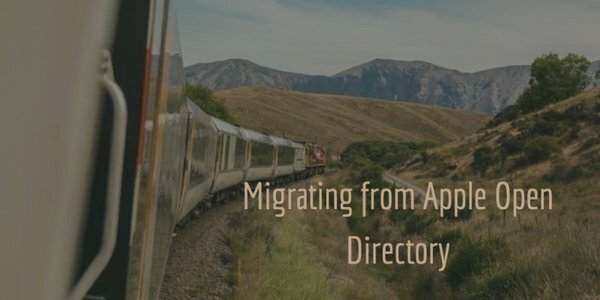 If you are thinking about migrating away from Apple Open Directory but still want your Macs to be tightly controlled, take a look at Directory-as-a-Service. It treats all of the platforms as first-class citizens. We’d be happy to show you a demo of how the platform works, or try it yourself and see. Your first 10 users are free forever.